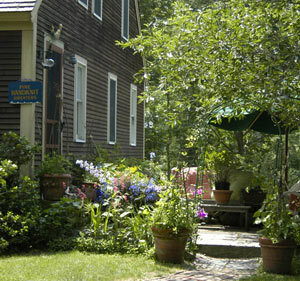 Welcome to Mermaid Woolens, located on Emerald Cove in the village of Sedgwick, Maine. Our sweaters, mittens, hats, and socks are all handknit using wonderfully textured fibers ranging from Maine Island sheep yarns to exotic homespun fibers of Quiviut, Yak, Mohair, Arctic Hare and Swedish Walsted wool. We dye our own roving and spin many of our yarns. Each sweater is originally designed and finished by Elizabeth Coakley, and with a community of hugely talented fiber dyers, spinners, knitters, and button carvers, Mermaid Woolens has captured the beauty and dreams of the Coast of Maine. As in the framing of Elizabeth's paintings, the trims and buttons are an important part of each sweater. We use French and Swiss velvet to trim out the neck, cuff, and waist bands. The buttons are the finishing touch to each sweater. They are made of shell, bone, shed antler, and fossil Walrus tusk. Two very skilled and talented scrimshaw artists from Alaska carve many of the buttons. Each adult sweater takes between 6 to 8 weeks to complete. There are many hands linked in creative passion and friendship that produce them, and we hope you enjoy wearing them as much as we enjoy making them. 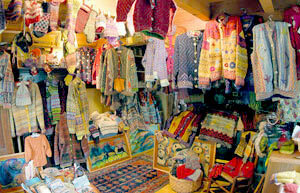 Come and get cozy with our wonderful creations. Download a free Mermaid Woolens Screen Sweater for your desktop.